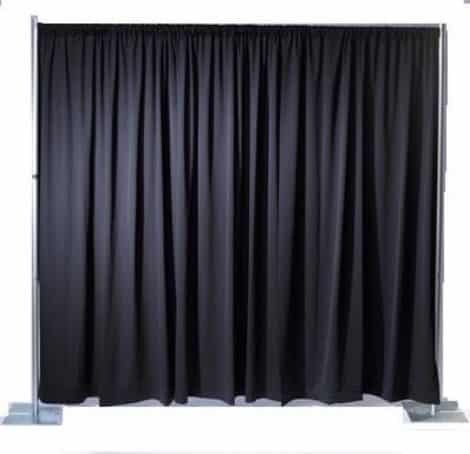 Pipe and drape is great for a backdrop, convention booths, room dividers, and more. 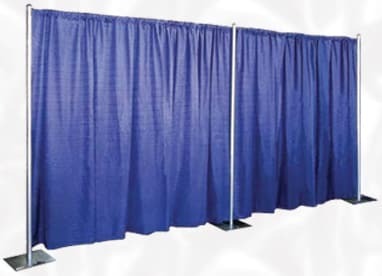 Our pipe and drape measures 8′ tall and can be either 6′, 8′, or 10′ wide and can be connected together to cover large spans. You also have your option of black, off-white, or royal blue for drape colors. 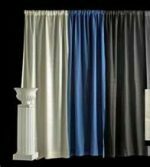 We also carry 3′ tall pipe and drape for convention boothing. The price does not change based on the width of the draping you need. SKU: PSA01. Categories: Miscellaneous Wedding, Party & Event, Miscellaneous Party, Lighting and Special Effects, Wedding, Dance Floor/Staging. Tags: convention boothing, pipe and drape, room divider. These stanchions are great for crowd control of any type and are rented per upright stanchion. The retractable belt is 6′ long and is included in the rental price. These screens are a beautiful backdrop for any event. Each screen is 8′ tall x 4′ wide when fully opened and have white fabric backings for the window openings. We also carry these screens in 7′ tall which are rented separately. These stanchions can give your party that red carpet, Hollywood feel. They are rented per upright stanchion and the red velvet ropes are rented separately. With our red velvet ropes, these stanchions can stand about 7′ apart from each other. We also carry red carpets which are rented separately. These screens make a beautiful backdrop for any event. They measure 7.5′ tall x 4′ wide when fully opened.